Although Annie Marion MacLean, teacher, sociologist, and leader, gained international fame as an expert on working women's issues, her significant contributions are overlooked by contemporary scholarship. MacLean was extraordinary by any standard�her level of education; her precedent-setting behaviors, research, methodological innovations, public impact, and writing; her dedication to women's freedom and social justice; and her love for family and friends. MacLean was a vigorous and creative exponent of the forceful spirit of Chicago sociologists. As a graduate of the department of sociology at the University of Chicago, MacLean became one of the founders of the discipline. MacLean was an ally and friend to other sociologists in Chicago who were both students and faculty at the university and at another world-class institution, the social settlement Hull-House. She gained fame as an expert on working women, using ideas to expand their options and respond to their need for social justice. Mary Jo Deegan documents the life, accomplishments, and works of this noted scholar. 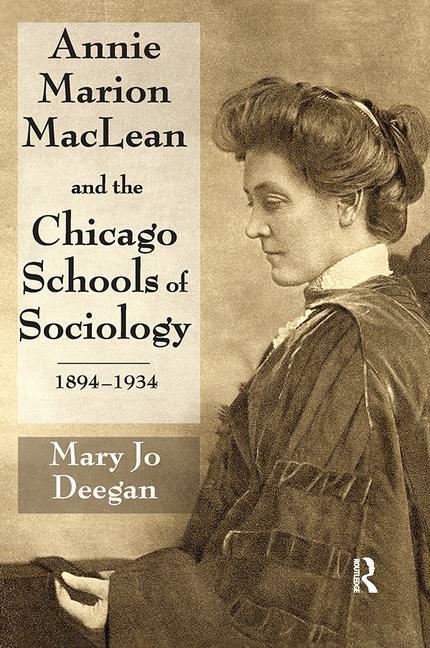 Deegan explores such topics as Annie Marion MacLean and sociology at the University of Chicago and Jane Addams' Hull-House, MacLean and feminist pragmatism, women and the sociology of work and occupations, women's labor unions and the feminist pragmatist welfare state, the sociology of immigration and race relations, and MacLean's legacy to sociology and society. Her inspiring story will be of interest to those exploring the roots of the discipline of sociology. Reading 7D: Fifty Years of the Y.W.C.A. Reading 10B: "Love My Dog!"